•4500 GRA 41' GONDOLA, PRR M.O.W. Operating Era: 1937-1970. THIS SERIES NOW COMES WITH OUR NEW ONE-PIECE ROOF FRAME. Pennsylvania RR. Pennsy took all of their fishbelly underframe DS cars out of revenue service beginning in 1936 (Long Island cars lasted into 1942). Many XL box cars were converted to MOW, or as Pennsy called them, camp cars, replacing earlier wood underframe cars. If the cars had sound roofs they were not replaced. 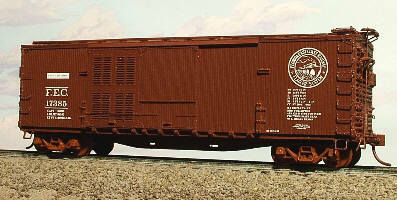 However, most were, using a plain mullion style typical of USRA box cars. Crew cars all carried water tanks in the roofs, Original roofs merely had them added as a cutout. New roofs had the side sheathing extended up to meet the tank. Therefore, there were two basic styles of crew cars. Equipment cars had no tanks but had either original or new roofs. Cars with sound, original plug doors retained them. Bad doors were replaced by sliding doors. All cars, crew or equipment, had end doors and a folding platform to allow walking between cars. A plate was placed between the two platforms for greater safety. Premade steps could be placed between cars or at the ends of cars by resting them on the platforms. The cars were originally painted gray body with black roof, underframe and metal details. The body color was changed to yellow in 1953. Lettering supplied in the kits covers 1937-1960's as most cars were never lettered in the 1954 and later styles.